Mackay Road Runners hosted a very social 5km & 10km run from the Bluewater Quay at 4pm whilst a bevy of talented local runners hit the famous Gold Coast glitter strip for the annual Gold Coast Marathon, Half Marathon, 10km and 5km. President, Tim Magoffin was on hand to give his usual course briefing from the awesome City Centre banks of the Pioneer River. Alan Zamparutti and Jose Short were the 10km champions of the day, scoring gold in the longer event, with a multitude of 5km competitors performing extremely well. Meanwhile, many novice and experienced local Marathon and Half Marathon runners were successful in attaining their goals at the Gold Coast on the same morning. 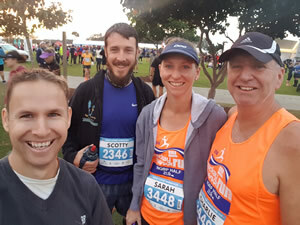 Despite being the middle of winter, humid conditions met debut marathoners, Karlee Hayden (4hrs 12mins), Joe Grech (3hrs 36min) , Charlie Bone (5hrs 36min), Sarah Jensen (4hrs 50min) and Scott McIntosh (4hrs 09 min) however, they were ecstatic with the longest running event of their lives to date. Congratulations to Lindsey Wiggins (3hrs 17min), Victoria Beck (2hrs 52min) and ex Mackay runner, Brad Allen (3hrs 29min) who notched more successful marathon events to their belts. Half marathon runners, David Perkins, Jenny Harmer, Carmel Grech, Chris Evangelou and Benita Willis were also stand out Mackay runners in one of the must do events on the Queensland running calendar. A hearty congratulations also goes to Brenda Windsor who completed the challenging Bravehearts 777 charity event where she completed seven marathons in seven days in seven states, with the finale being the Gold Coast Marathon. Brenda, who is an amazing person and runner, set and achieved many goals in the lead up to completing the 777 event. Her enormous commitment, character, focus and discipline to get to the finish line of such an arduous and challenging task showcases what a great role model she is to her peers and the community at large. This Sunday’s handicap start Mackay Road Runners’ Club event, Robbo’s 61 Steps 5km & 10km commences 4pm from the Gordon White Library carpark. Runners are requested to arrive by 3.50pm at the latest for a 4pm sharp start. Please give consideration to race day volunteers by adhering to all notices, wearing your individual timing chip and member race number.